This comment, “time is suspicious”, was made by a 9 year old boy who came into my classroom one day. He had just learned the word “suspicious” in his regular classroom, and apparently tied it in with how “odd” time can be. After he said that, I thought a long time about that idea…the “subjective” experiencing of the passing of time really is a bit “suspicious”..sometimes incredibly slow (usually when I’m not happy), other times somewhat slow….sometimes incredibly fast (often when I’m really happy), other times somewhat fast…kind of bizarre really….very “suspicious” ! I actually thought about that idea for weeks…and now am developing a much broader understanding of the tremendous variations in the “perceived” speed of time passing…as opposed to the measurable, linear aspects of time: 60 seconds=one minute. 60 minutes= one hour. 24 hours= one day. 7 days= one week. 52 weeks= one year. This entry was posted in Appreciation, Awareness, Courage, Flourish, Happiness, Inspiration, Life, Mindufness, Personal growth and tagged Appreciation, Awareness, Courage, Happiness, Inspiration, Life, Mindfulness, Spirituality. Bookmark the permalink. 25 Responses to Time is “suspicious”…. Out of the mouths of babes! Kids always have the insight- hope they never outgrow that gift! I teach Resource, so work with kids from kindergarten through 5th grade. When we first heard this comment from this little boy, I thought that he had misinterpreted the meaning of “suspicious”. After thinking long and hard, I realized that he may have had more insight into time than I did. At first, I thought he might be thinking about how long it takes for recess and lunch to arrive and how quickly recess and PE are finished. But after thinking more about his life…he has had several major losses…I think he was talking about that big picture of life…one I barely understand and that he is grappling with. What a beautiful blog you have, very heartfelt. I really appreciate your curiosity towards life, the questions you ask and thoughts you shed. I have always wondered about the concept of time, it is truly a mighty subject to grasp, from any corner. What I find most curious about time is the nature of its infinite loop and the relation to our very temporary existence…your post reminded me of Andy Goldsworthy and his ‘Time’ series, as well as Rivers and Tides – also a wonderful thought provoking docu film about temporance and our relationship to nature. Time is truly suspicious! Thank you….I’ve been grappling with lots of questions over the years…as you may be able to tell from the pages in the various blog posts. Rivers and Tides is very special. I think Andy Goldsworthy is working on another documentary/piece now. I saw a photo of him creating a continual loop of tree trunks, in Golden Gate Park in San Francisco…it was remarkable how intricate the curves were and the time and energy that he was putting into that project! I didn’t realize that he has more projects too…I’ll look for them. Any name/titles in particular? : ) …I was just editing it for grammar…and punctuation…I should have paid more attention in my high school writing class! I saw your “like” as it was posted and thought….”uh oh….I hope that PonderingTurtle is okay with encouragement!” whew….you’re okay with that! Happy to have you here. There are some wonderful blogs along the right column…in the blog roll….beginning with the word “Blog:…….. You can get lots of idea about formatting, how people set up posts, writing etc…it’s a lovely, encouraging community. Thanks for your wish for a lovely day… : ) ….and I actually am having a lovely day, too!!! ohhhh nooooo…now I got confused and lost my reply! Oh, the learning curve! I’m constantly amazed by the wisdom that comes out of kids…I learn so much from them. I think I’ve seen picures from that project..,its so hard to choose a single favorite from Goldsworthy, but I would have to say my personal favorite is his book “Time” (came out in 2008), all the pieces in there are related to the concept of time (as does all his art) with accompanying text on the ideas and process behind his works. I think I’ve seen pictures from that project..,its so hard to choose a single favorite from Goldsworthy, but I would have to say my personal favorite is his book “Time” (came out in 2008), all the pieces in there are related to the concept of time (as does all his art) with accompanying text on the ideas and process behind his works. I’ll look for that book…I’m a bit fascinated by time….ever since that little boy made that comment! Have you done any art work that includes time or aspects of time? Time is very suspicious and very sneaky, I’ve always watched it quite closely. Very insightful child you have in your class. Now if I can just remember to be suspicious of my own subjective sense of time, I’ll be way better off! Strange how it’s sooooo difficult to keep that in mind, during difficult times! And yes, he is a very insightful child. He often comes up with little comments that have such wisdom. He has known loss and sadness….I guess that contributes to his own wisdom. 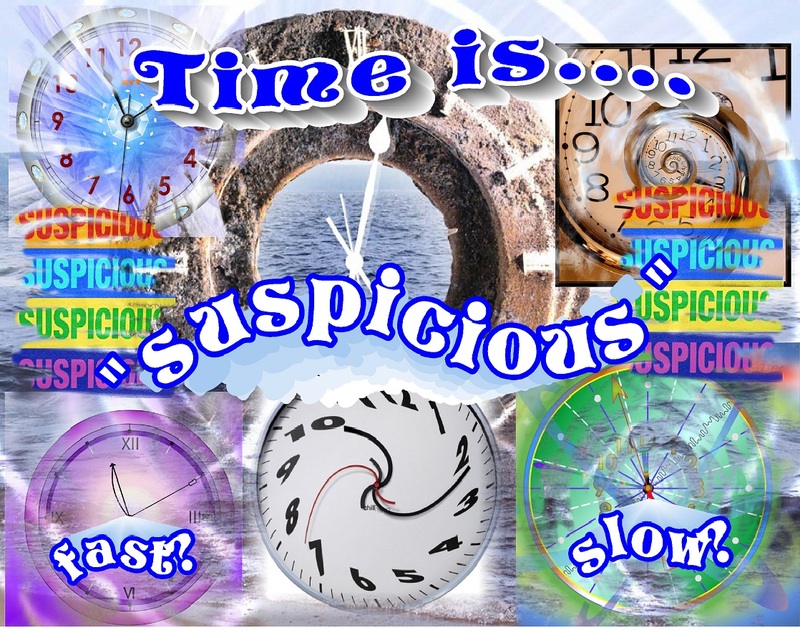 i’ll have to ponder the phrase…”time is suspicious”…is it really time…or is it our perception of time? do we assign human characteristics to intangibles, just so we can wrap our brains around them? or do the intangibles exist to tease and confuse us? I think that his idea really is a “brain teaser”… And your points are well said….and your questions that come out of that little boy’s statement… insightful too. For myself, I’m thinking there are several very different types of time…clocks etc and subjective sense of time passing…and often for me they seem to be very different. Time is a strange commodity if you have PTASD or Complex PTSD. As you write time can seem to linger forever or pass so quickly we are not even aware of it. The Zen that I was taught changed time in its own way. I learned to slow the tempo down with breath first then the thoughts, brain and became so much more specific. Sometimes you can enter a space totally with practice. My training would ask you to take a simple task and enter that task. For instance preparing a meal. Specifically chopping things and preparation. My mind would settle into observing every slice. My purpose when asked, was to prepare the best meal possible with the ingredients on hand. That changed my direction from getting done as quickly and unawre as possible to a purpose that I entered the process. Slowly I watched as I cut vegetables and soon time had ceased. I was inside that process and time was not a concern. Everytime you sit time is distorted. A question, Kathy, does Complex PTSD alter time or our perception of it? Does time force us to act or react rather than stay present and aware? I’m going to have to “ponder” this one….and that’s going to take…time… : ) I’ll get back to you. My opinion; Dissociation alters both our sense of time, perception of time and our sense of who we are, I think. Dissociation can cause you to lose days and seem to be in an altered world at times. Reality and delusion become mixed and cloudy. Distortion follows and not just with time. Another thought about time and Complex PTSD. Someone who is not a person with Complex PTSD can not even understand why an event that happened in childhood, for me 50 [plus years ago is so alive and livid today. How can time be stopped like this frozen with our skills at the time of the trauma. Yes, so time has been frozen and the trauma is as real as 50 years ago. Time and some of our emotional development have been left behind in a time capsule no doubt. Complex PTSD changes not only time but events. Thoughts? And yes our perception of time can be helped with a daily journal.